Fish Creek Grill (formerly Arroyo Bay Grill but same owners and menu with additional American options) opened in 2013, at the top of the hill in Fish Creek, right across from the Door Community Auditorium. 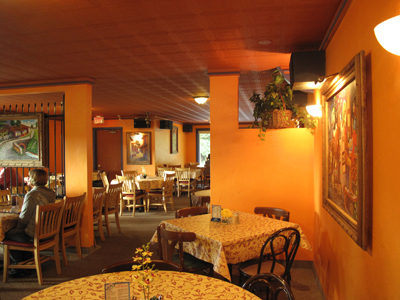 It is an authentic Mexican restaurant, owned and run by two brothers, Nino and Armando, of Mexican heritage, who have been in Door County since about 1992. At DoorCountyNavigator.com, we love to see the owners there on a daily basis. Mexican and American food - awesome! Nino is usually the front guy, and Armando is the head chef and the food is very good, fresh and real! Read on! The ambiance is colorful and calming, with many Spanish fiesta tones, paintings and decorative glass – reminiscent of Acapulco. You walk into the door and the full service bar with a pool table is to your right. Walk down the hall and to the left and you will find someone to seat you – oftentimes it is Nino himself. Video coming soon! There’s plenty of seating across three rooms, with larger round tables perfect for families or larger groups dining together. 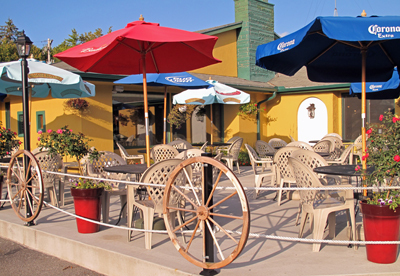 In season, there is an awesome outdoor seating area with umbrella-ed tables – very pleasant. And there is plenty of off-road parking – no worries! The menu offers something for everyone, from a simple Farm Sandwich (a chicken filet with bacon and Chihuahua cheese) to full blown seafood dinners, like a pan fried tilapia or haddock. There are whitefish sandwiches, firewood wraps (like the beef, pork and chicken wraps are prepared on their firewood grill), salads, Mexican lunch specials and lots to choose from for dinner. And yes, there are American dinners too like a rib eye steak, a Door County whitefish, charcoaled chicken breast and more. But reviewers are coming for the Mexican fare! They even offer a handmade pizza (we watched them make) and it looked awesome. Some folks who were dining in and eating a pizza loved it. There is a selection of soft drinks, tea, coffees and more. But they also had Negra Modelo and other Mexican and domestic beers. OK, now we’re talking! In our case, Nino himself took our drink orders. There is a great selection of beers, including Dos Equis, Corona, Negra Modelo, and American beers. Nino tells us that his customers tell him he has best margarita in Door County! We ordered a Negra Modelo (perfect with hearty Mexican food – no lime required) and a Corona. As our drinks arrived, so did a large basket of warm tortilla chips with a zesty salsa (with lots of cilantro). We enjoyed this treat and finished off the basket. Some of our reviewers have dined in Mexico – so we were ready to compare. One of our Reviewers ordered the Firewood Grill Sampler – this is a meat-lovers delight. The plate was piled high with marinated beef, pork and chicken. Very generous portions, and our comment was “it tastes home made.” Order this one – you will love it. 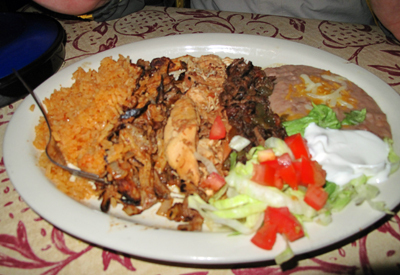 The second Reviewer ordered Whitefish Tacos, served with refried beans, rice (which was nicely done, and not sticking or clumping together). The refried beans were good, creamy and authentic. The two tacos had a mix of white fish (done just right), lettuce, tomatoes and a medium salsa on the side. The tacos were delicious, with just the right amount of spices – wishing we had a third! We thought we would try one of their desserts, so we ordered up a churros with cherries (it’s Door County – you have to have cherries!). Again a generous portion, with cinnamon; delicious and a delightful way to complete our meal. Fish Creek Grill also offers cherry or apple pie, a Chimichanga Cheesecake, fried vanilla ice cream and a dessert du jour (hey isn’t that French)! Afterwards, we introduced ourselves to Nino, one of the two owners, and told him that we enjoyed our mean immensely, the service was excellent, and that we would be back. And we have been! Open year round, 7 days a week, for breakfast (until 2PM), lunch and dinner, we recommend you try Fish Creek Grill– you will be surprised to find authentic Mexican fare right here in Fish Creek. In season, dine outside for a great experience. Food is very good, fresh, and authentic. Our reviewers who have dined in Mexico loved the experience here. We have been back, and will be again. 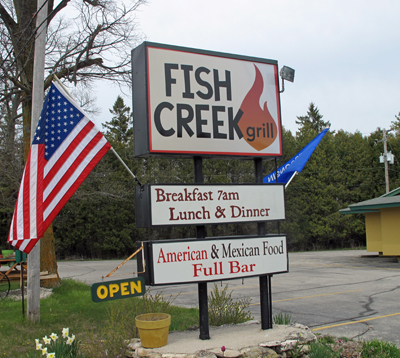 We suggest you head to Fish Creek Grill in Fish Creek, and please tell Nino and Armando that DoorCountyNavigator.com sent you – that helps us provide all of this information to you! For your convenience, here is a peek at their old website which they still have up - pretty much the same menu and flavor of place. To open it fully, click the link on the lower left of the frame.